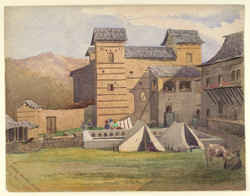 Watercolour by Alfred Frederick Pollock Harcourt (1836-1910) of the Rajah's Palace at Mandi in Himachal Pradesh, dated 5th April 1867. The image is inscribed on the front in watercolour: 'Mundee Rajah's Palace. 5 April 67' 'A. Harcourt'; and on the back with notes in pencil. The Rajah at this time was Bije Sen, who at the age of four succeeded his father Balbir Singh, and in 1866 acceded to the throne after the regency of Wazir Gusaon. Harcourt served with the Bengal Infantry in India from 1855 to 1889. He found the Punjab Hills a particularly inspiring landscape for painting and drawing and in 1871 his book 'The Himalayan districts of Kooloo, Lahoul, and Spitti' was published, illustrated with lithographs from his drawings.